As with any new comic book series, the first issue has to draw you in, world-build, and establish an engaging story. 'Red Sonja' Volume 4 #1 does just that with a familiar plot but with the Queen of the Hyrkanian Age in all her glory. Amy Chu and Carlos Gomez take on the sword-wielding warrior and come out a winner. 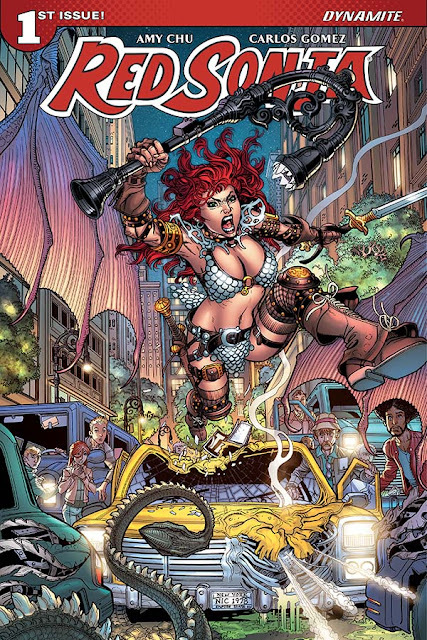 Red Sonja suddenly appears in modern day New York confused and confronted with a number police officers with guns drawn. Luckily, she finds an ally who can communicate with her. Why is she there? More importantly, how did she get there? Issue one sets the table and leaves a lot of questions unanswered but does set-up an intriguing story ready to be unraveled. As familiar as this fish-out-of-water story is, this is still Red freakin' Sonja so her fierceness drives this latest volume of the "she-devil with a sword." As expected, Sonja won't be taken down easily, fighting these strangers in a strange world. It's all beautifully laid out and choreographed by Gomez with plenty of detail. He rightly keeps Sonja at the center of the action. Mohan's colors add a warm glow to the wintry cityscapes. From the character designs to the intricate features of the backgrounds, Gomez draws readers in with an inviting art style. 'Red Sonja' is the perfect adventure series to help escape the plethora of superhero titles in comic shops. And who better to cheer on than the She-Devil herself. Chu and Gomez offer a great first issue full of energy and action that looks great too.